Food is available at the Captains Flat RSL & Citizens Club, Friday and Saturday evenings - phone (02) 6236 6284 for details. Community Groups hold sausage sizzles at the monthly markets; and there is also a café with tea, coffee and cake. There are a number of different options for getting to us from Sydney - unless you want to take a huge detour, all require you to leave the Hume Highway at Goulburn. This means that you avoid the very boring Federal Highway to Canberra. You will also skip most of the Monaro Highway to Cooma. You can leave the Hume Highway at the first Goulburn exit, which takes you through the town centre (but savvie travellers know you can turn left at the Mobil service station rather than going through all the traffic lights of the main street). A quicker way is to leave the Hume Highway at the second Goulburn exit, the one with the McDonalds. At the roundabout, turn left, away from Goulburn, and then left, and right and then right. You are now on the road to Braidwood without having passed through the centre of Goulburn. Follow the signs to Braidwood initially, taking you through the picturesque villages of Lake Bathurst and Tarago. about 25km south of Braidwood you turn right onto about 25km of dirt road, passable at all times of year. * from there head towards Canberra but just after the 100kmh speed limit sign on the edge of Bungendore, turn left (signposted to Captains Flat); turn right at the top of this road (also signed) and continue along the Hoskinstown Road. - right it takes you along the Briars-Sharrow Road, joining the sealed but bumpy and windy Queanbeyan to Captains Flat Road. 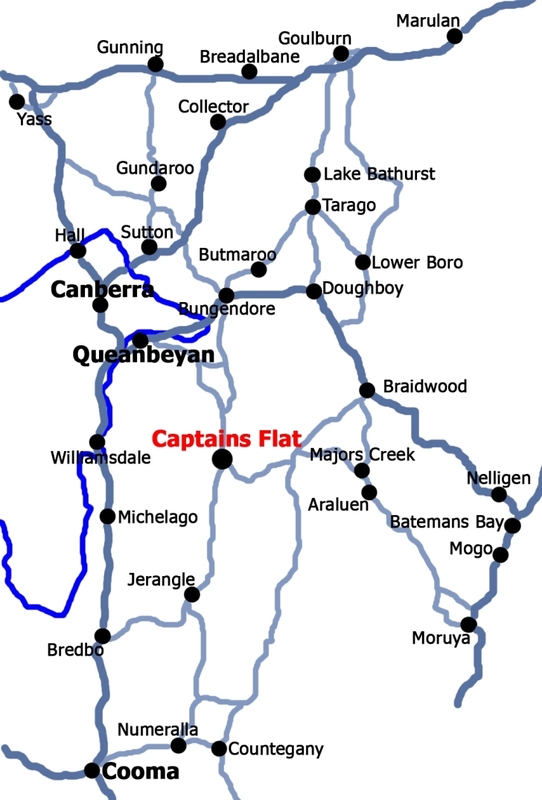 - straight, you have about 20km of largely dirt road through the village of Hoskinstown (no services), eventually needing a right turn signposted to Captains Flat, and joining the Queanbeyan to Captains Flat Road about 12km out from "The Flat". When you arrive in Captains Flat, take your time to look around, refuel, eat, or stay a while. Then continue on your journey south on 5km of sealed and 30-ish of dirt to the hamlet of Jerangle, with a 19th Century stone church, a tiny school, CWA hall, derelict hotel and not much else. * South on a very picturesque drive to the small village of Numeralla (no services) which is about 20km from Cooma on a sealed road. Note - If there has been heavy snow recently, these roads south of Captains Flat may be closed or impassable - this is not frequent, a once-a-year occurrence at most. Conversely, if the Monaro Highway is closed by an accident, as occurs several times a year, you may be diverted via these back-roads! Also rain can affect many of these roads - if it's been wet recently, ask locals whether the roads onwards are open. Even the sealed roads have been closed recently [written end December 2010]. See the Links page for links to a journey planner and various scenic drives in the area. Feel free to email us for any further information or advice.